One-hundred-and-four West Coast Eagles fans travelled almost 3,500 kilometres to see their home side take on Hawthorn recently. They were only a fraction of the West Coast fans that poured into Melbourne, but this motley crew were so determined to cheer on their boys ­– they thumbed their noses at the extortionate cost of flights and caught the bus instead. 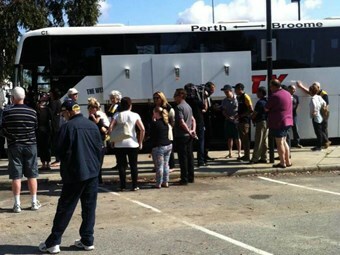 Two 52-seat Integrity Coach Lines coaches left Perth on Wednesday, September 30 and arrived in Melbourne two days later on ALF Grand Final eve and wasted no time embracing the finals footy fever. Integrity Coach Lines marketing manager Liz Collins could barely contain her excitement about the special footy themed charter journey and is pleased at how it all came together at such short notice. "We’ve never done this before and to tell you the truth it’s exciting to be around for it," she says. "When Freemantle were in the finals two years ago we had calls, but didn’t really consider putting on a service for it. "This time we knew the demand would be there, so we went for it." A lot of enquiries came via Facebook and word got around quickly, the last seat on the second being filled the day before departure. "We put it up on Facebook and the list just grew and grew," Collins says. "We were getting so many calls on the Monday, more than for Perth to Broome, which is our regular service. People were really dedicated. "We are used to long distance travel, and although a little challenging, it was no real hassle to put on the coaches at short notice." The coaches had two drivers, one sleeping and one driving in shifts with plenty of stops along the way to ensure everyone’s comfort. Integrity Coach Lines also sold a few one way tickets for those who chose to fly one way and catch a coach the other. West Coast Eagles was due to play Hawthorn Hawks on October 3 at the MCG in Melbourne.